Take note of my lovely ET sheets. I still have them. Upon visiting my mom, I stumbled upon a red journal filled with entries from my week at Girl Scout sleepaway summer camp in East Hampton's Camp Blue Bay. Summer of 1985 I was 12.5 years old. I loved The Goonies, Cyndi Lauper, makeup, gummy bracelets, friendship pins and Huey Lewis & The News. Looking back, summer sleepaway camp sort of prepped us for college dorm life. I love how I documented everything I ate! Such a chubber! I'll admit, these diaries are queer and boring. My comments are in parentheses. Today I re-met Nikki from last year. I met two new really nice girls, Lisa and Diana. I just set everything up, it looks neat. I wrote 2 letters so far. One to my friend Serena and another to Mom. I took the swim test. I ate a mayo and lettuce sandwich for lunch (ew?) OK, time for dinner. I'm back and ready to write. I'm also alone. I have bad windburn on my cheeks. It's now 8pm and getting dark. I wonder where everyone is. I mailed my letters. The other girls are starting a camp fire. I'm gonna write Danny a letter (Danny was my platonic male best friend). It's now 9:21pm and we made smores. Dee is reading her bible and I'm laying on my bed holding a flashlight. I love Sean Astin. Good night. Posing in front of our "lean-to" showing off my Tommy Howell pin-up. So far I ate bread and butter for breakfast. We went on the BMX bike trail. It sort of stinks. My hair is very wet. I put my head under the hose. It's break time now. Nikki really hates me, but that's okay because I hate her more. I might move in with Kristen, Athena and Nicole. I can't stand it here in the tent with Nikki and Dee. They're always fighting with me. I'm friends with everyone at camp except Nikki and Dee. Lisa is nice though. For lunch I ate 2 tacos. I found out I can't move in with my pals in Tent 6. Nikki and I are trying to get along now. We all had a water fight before, it was fun. I bought a really gnarly tote bag (ha ha, gnarly!) and Collette, a counselor from Belgium thought my name began with an "E" and wrote "Ellyson" on my bag. I don't really care though. It's break now. We had to clean the bathrooms. We ate pizza bagels for lunch. We played line basketball and killer for 2 hours. I went rowing for a while. I hate swimming. I don't like Andi that much and don't think she should be a counselor, she's not that nice. I can't wait to go home tomorrow! We have lazy day, we get to sleep til 9am! I love Sean Astin. I miss Mom. I wrote Mom, Joe (brother), Serena and Danny. They made us write to our family again today. We had a big talent show. I wanted to do a lip sync. We looked so dumb. I ate potatoes for supper. Stay tuned for Part II of the exiting and dramatic Camp Diaries. Did you go to camp? Did you keep a diary while at camp? Reading over that, it really makes me glad I never went to camp. When you're highlighting cleaning the bathrooms, things have gone wrong. Camp Blue Bay is my camp! It's wear I spent 11 summers of my life. Ah good times. I smiled when I saw you comment on one of their facebook statuses the other day. Swimming was the worst. It was amazing later on when they added jellyfish nets though. I mean, the fact that there were no more jellyfish not the fact that we had to go swimming. I always wound up getting my period the week of camp when I got older. They didn't care and made us swim anyway. I still sing the songs from there all the time and every time we have a storm I sing the Innisfree theme song. did I really just use the wrong form of where? wow... that means it's bedtime. Never had the pleasure or non-pleasure of attending camp, (skating was my life) although I think I would have loved it in my preteen years. By the time boys came into the picture, no so much. (unless there were awesome guys at camp) I was always a tomboy pipsqueak. I went to church camp a few times and they're only a week long at a time...I usually didn't have a good time. It was hard for me to make friends because I was shy. Very insightful about the 'Sugar Pops' thing, so true. @Tom Hofstra University is a private college on Long Island. In addition to sleepaway camp that summer, I attended their drama day camp. 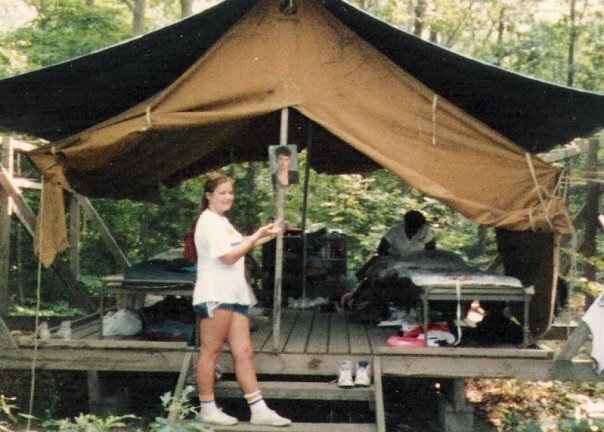 It was much more my style than roughing it at sleepaway. The highlight of my day was eating gourmet tasting meals in the college caf and swimming in the huge indoor swimming pool. The theater was air conditioned as were all of the indoor areas. What a difference! Big diff in price too! I hated Camp. I had been to one on a School Trip. We got lost in the woods and some guys came to pick us up after a day. Hi! Found your blog through Jen's Food Journey! 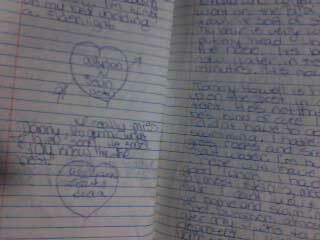 Aww, I love your diary, the fact that you keep saying you love Sean Astin is so cute! Haha ... and you said "gnarly" which always makes me smile (I even used it in a comment on another blog after reading your 'Valley Girl' post). We don't have anything like that over here, which I've always thought is a bit of a shame, but maybe not so much now, it can't be much fun to be stuck in a situation like that if you're not enjoying it. I need to know what 'Gummy Bracelets' are ... are Gummy Bears involved? And what the heck is 'Killer' ??? That has to be the scariest-sounding game EVER! Yep! sounds like camp alright! Its much more fun as an adult. Ahhh, I totally remember those days. I was a career sleepaway camp kid. I even went back and worked as a counselor. Some of the best and worse days of my life (digestively speaking). FYI...Nikki never hated me. Whew! Great trip down memory lane. b) i was kicked out of the girl scouts...perhaps I'll have to share that story at some point. I'm sorry to say I have no recollection of the game "Killer" - maybe it was a verbal game played between kids? Maybe it was an intense dodge ball game? I honestly have no clue. It could have even been a board game or card game! Hmm. May need to research this. Google "Gummy Bracelets" they were popular plastic stretchy bracelets popular in the 1980s, brought back around 2000. I picked some up at Urban Outfitters about ten years ago, you can still find them at stores like Claire's or Target I believe. I prefer the black ones, as a child I loved all the different colors. Think Silly Bandz only just circular shaped. You know what, I will blog about Gummy rings and bracelets just for you, Girl Interrupted. This is so funny. I love how you wrote about Sean Astin in every entry. Hilarius. Sound like my camp experiences. But even as an adult, I.HATED.CAMP! OMG..we so liked the same things growing up. The Goonies is still one of my all time favorite movies! Thanks for sharing your camp adventures! Wow. I did all of that in sleepaway camp. Dang. Maybe I ought to post some of my letters home? I still have a few. Oh crap, I mean I have the letters my parents sent me. lol maybe I'll post a few my mom wrote. After Mom was kicked out as a Boy Scout Den Mother for the most ridiculous thing, and the PTA went on a witch hunt with her as the scapegoat, I tried joining the Brownies (or was it Bluebirds?) with much hesitation. Went on one overnight gig in the local mountains and discovered girls could be mean, nasty, catty and downright awful. I never did that again! Loved this story! Brought back the days of camp! And great pics. Thanks for posting this today. Made me smile! I actually never got to know the amazingness that is sleepaway camp. I always went to day camps. Looking back on it, I guess I've had a phobia about sleeping anywhere besides my own bed pretty much forever. I kind of feel like I missed out though. I definitely would have kept a journal if I had gone! LOL I have so many diaries I laugh at the immaturity and the things in general then im saddened by the things i used to write which made me realize i didnt enjoy the childhood that was supposed to be CHILD hood. I grew up too fast but then I realize that growing up around adults causes that. Oh, I loved this! So glad you were a writer even then and I loved seeing your loopy handwriting. This post brought back lots of memories! But tell me...did you love Sean Astin?? I never got to go to camp! There were 5 kids by the time I was 10 and it was too expensive. We got a pool pass and I got the joy of watching my 2-3 siblings. The baby went to daycare for the first couple years. In my life, camp sucked...I am not a "plays well with others" kind of guy..camp activities were way too organized, and the food was terrible! The cabin smelled like feet, and as they were a church camp, we spent a ridiculous amount of time going to chapel.. 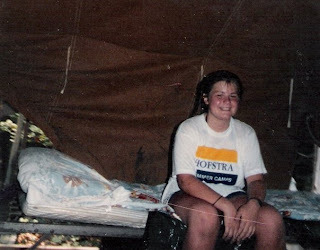 I was a Girl Scout and our camping trips were to Camp Hoover somewhere in North Jersey. Didn't mind the cabins - hated the tents. We went to Camp Kettle Run in south Jersey once. We went on trips to DC and Virginia and stayed at camps there too.I wish that I had kept journals like you did. I enjoyed reading about your camp experiences. I love reading your old diary entries. I only went to camp with my school a couple of times and always wondered what American camp was like. I also hate daddy long legs - STILL! I went to Girl Scout camp a couple of times and suffered through band camp in high scool, too. I didn't enjoy either one. I went to camp for a week in sixth grade and your journal entries look like mine back then. Minus the Sean Astin references with more bad food involved. Eww, mayo and lettuce sandwich haha. I love that you are wearing a Hofstra shirt in the first pic. My FIL went there. His parents still live in Long Island. Anywho, I never went to any camps when I was younger. I always wished that I had, but I was kind of a dork so there is no way that I would've fit in. Loving your diary entries though! I wish I still had my diaries.